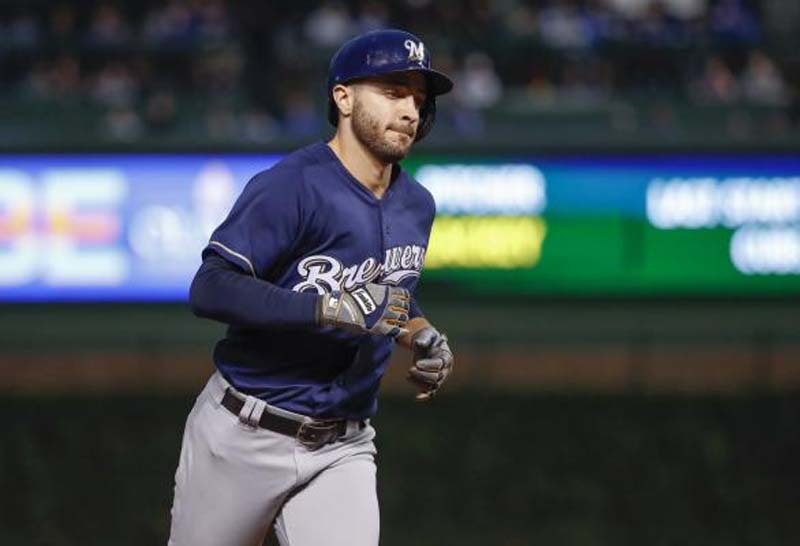 Ryan Braun will be back in the starting lineup Sunday when the Milwaukee Brewers wrap up their four-game series with the St. Louis Cardinals at Miller Park. Braun left the team ahead of their scheduled game in Pittsburgh Wednesday morning to get an injection on his right thumb -- a process he undergoes every few months after a nerve issue in the thumb robbed him of his power in 2014. Braun returned to the team Thursday ahead of the series opener against St. Louis but despite being ready and available, according to manager Craig Counsell, Braun has yet to appear in a game since coming back. "Ryan is doing fine, he's doing great," Counsell said Saturday before the Brewers' 3-2 loss to the Cardinals. "I just think that if we can give him more time, great, that works out for both of us in that perspective. He'll play (Sunday)." With Braun sidelined, Eric Thames has seen most of the action in left field, a move that allows Counsell to keep hot-hitting Jesus Aguilar at first base. Putting Thames in left also allowed the Brewers the flexibility to option slumping outfielder Domingo Santana to Triple-A Colorado Springs Saturday morning. The 25-year-old Santana hit 30 home runs in a breakout 2017 campaign but with his playing time limited after Milwaukee added Lorenzo Cain and Christian Yelich during the offseason, Santana hasn't made the most of his limited opportunities. He was batting .249 with three home runs, 17 RBIs and a .667 slugging percentage while going more than two series without a start. "We need to get Domingo going," Counsell said. "At some point, we're going to need Domingo. We'd both prefer he'd be rolling and clicking when that time comes. It's tough to do when you're not playing that much. "Eric and 'Aggie' are playing well. We're trying to find ways to get them both in the lineup. That's a factor in this." To replace Santana on the active roster, Milwaukee recalled infielder Brad Miller from Colorado Springs. That move could help the Brewers address another troubling situation: The season-long offensive struggles of shortstop Orlando Arcia. Arcia is batting .201 with a .234 on-base percentage this season but has remained in Counsell's starting lineup on a regular basis because of his stellar ability on defense and because the Brewers lacked other viable options. Eric Sogard has struggled at the plate this season, too, batting .146 with a .255 OBP. Counsell prefers to keep Jonathan Villar at second base, where he moved after Arcia was promoted two years ago and Tyler Saladino, who performed well enough after joining the team in May for the Brewers to send Arcia to Triple-A is out indefinitely with a serious ankle sprain. "Brad has played all over the field," Counsell said. "He played a lot of shortstop for a while, then he played a lot of second base, then a lot of first base. So, he has moved around in different years, but it's been a while since he played shortstop." One thing that has been constant for Milwaukee this season is right-hander Jhoulys Chacin. As has been the case for most of his career, Chacin has been especially effective at home this season where he's posted a 2.31 ERA in six starts at Miller Park. Overall, he's made a team-leading 16 starts this season and is 6-2 with a 3.18 ERA. He's held opponents to a .231 average and a 1.24 WHIP while striking out 66 in 87 2/3 innings. "He's pitching," Counsell said. "He's got some cunning and some craftiness out there, as well as good stuff." The Cardinals will be trying to get a split of the series after Yadier Molina hit two homers Saturday. The Cardinals dropped the first two games by committing four errors Thursday and allowing a game-ending homer to Aguilar Friday. Molina has five homers in his last six games and guided Miles Mikolas through 6 2/3 strong innings. "What he's doing behind the plate is willpower," St. Louis Mike Matheny said. "Being able to handle pain and discomfort. He's smarter at the plate. He has such a great idea, and he's dangerous, obviously. It's hard to say, if he kept playing, where he'd be right now in the home run column and a number of others." Right-hander Luke Weaver gets the nod for the Cardinals as they try to build momentum after snapping a three-game losing streak. Weaver will be looking for his first victory since May 11 when he threw five shutout innings in a 9-5 victory at San Diego. In seven starts since that outing, Weaver is 0-4 with a 4.46 ERA and has allowed four runs in each of his last three starts while recording only one out past the fifth inning. He's 2-2 with a 4.41 ERA in six career starts against the Brewers with a 2-2 mark and 3.68 ERA in four starts at Miller Park, where he lasted four innings and took the loss after giving up four runs on four hits in an 8-3 loss on May 28.